Turn delayer and damage reducers will help on boss stage. Be cautious of Stage 4/5 - it will have units that Bind. You want to avoid stalling here. Stall effectively to try and get your GP Usopp's Special up by the time you reach Chopper. (don't be afraid to take hits). You encounter 5 pirates from turn 1-3. So make sure to stall at least 3 turns here. If you want you can stall up to 4-6 turns here when taking 2100 damage. Wipe the pirates on one go or get chain sockets. You can stall easily on the 28 HP turtle. Defeat the cape guy first. The other one on next turn and stall on penguin. If you use a character without a boost, you might stall even more on penguin. Thats the usual raidboss 4/5 stage. Elder Seahorses will chain you and the rest are just annoying high DEF mobs. Make sure you have 2 characters in your crew that have combo of 6 or higher and use them on the seahorses. This Captain ability (Fighter ATK by 2.75x) requires you to have 30% of your max. HP to activate! Chain sockets are very recommened on this crew but not necessary. 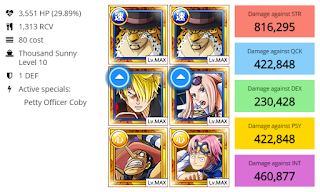 For 4/5 stage you can use Diable Jambe Sanji to deal 5000 true damage and wipe all with one special. 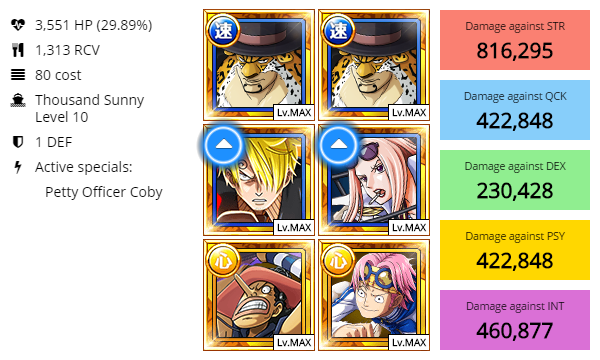 You can vary this team but GP Usopp and Hina/Kaku/Sanji will probably stay. Actually a peacewalk. You can stall for unlimited turns until monster chopper with this high recovery to have all specials ready and deal the final blow. 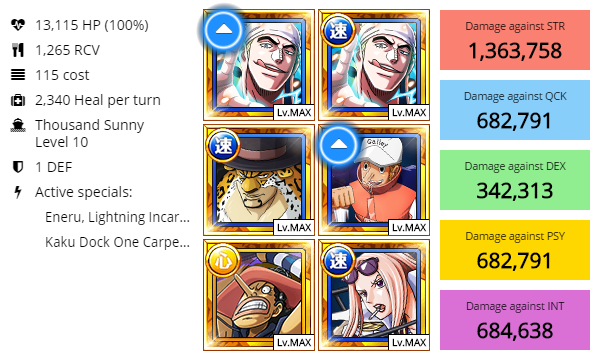 Use Usopp if you are not so concerned. Otherwise use "Ganfall" or "Pell" for a one turn blow.